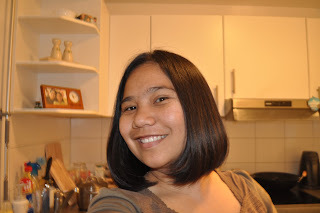 Just About Anything: This Bloggger Had A Haircut! Okay. So I was late in posting my movie entry and the linky for Tuesday Couch Potatoes. And that was mainly because I had an appointment with my favorite hair dresser Ms. Loraine. It's summer and getting hotter each day. I have a hair fall problem, which if not taken cared of promptly could lead to losing all of my hair soon! I want to save on shampoo and water. I want my shower time and hair drying time shortened. I want my hair manageable and just wash and wear. I have always had long hair most of my life and a long hair seems a little boring. I thought a short hair would make a new change. I want to be a little different for a change. And what of my long hair being sayang? Well, I am still young and I know that in a year, I will be able to grow it again. Me and my new short hair! The solution: cut my hair short. And that's just what I asked Ms. Loraine to do. I think she did a fantastic job with my hair. Although my face looks rounder, the new hair sytle made me look younger. And I feel lighter too. I hope with my short hair, my hair fall problems would lessen or diminish. I was here earlier, around 11am local time, and TCP wasn't up yet. hihihi.